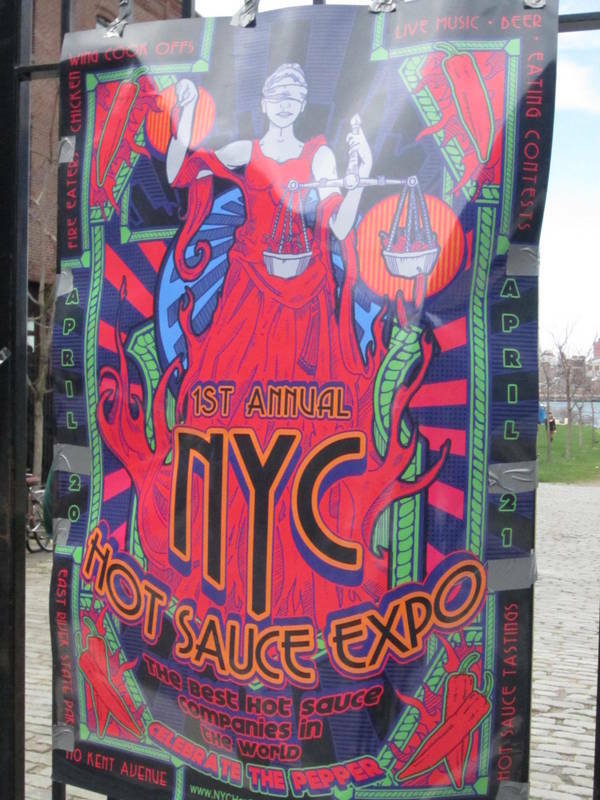 As promised, here are the NYC Hot Sauce Expo photos! Better late than never no? We had an awesome time at the event this year and picked up a few great products. If you’re a spicy food lover like I am you should definitely look into getting some of these products if you don’t have them already. Willikers delicious spicy chocolate syrups are a must in cocktails, over ice cream or in hot cocoa. I preferred the dark chocolate made with toasted marshmallows and chile spices. Lucky Dog brought their special wax sealed bottles for the event. Below are the brave souls that participated in the deadly, spicy lollipop lick-a-thon hosted by Michelle from Intensity Academy. She makes the hottest lollipop in the world and some tasty spicy mayo too. How hot were these you ask? These lollies are only 2.3M Scoville units, that’s about 500-600 times hotter than a jalapeno pepper! Seriously people, why would you do this to yourself?! I make spicy lollipops and wouldn’t try this! Some people have much higher tolerance and were definitely testing their limits…pretty amazing feat I think. They look so happy here in the “before” shot but you gotta see the “after” shots! I’ll post video tomorrow for you guys if I can get it to upload. 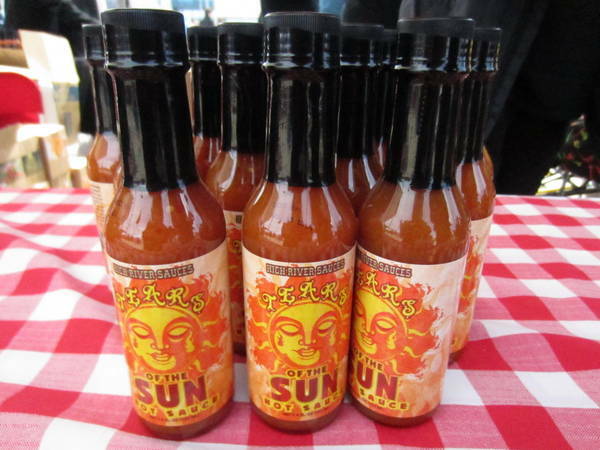 Event organizers High River Sauces have an amazing arsenal of hot sauces. One of my favorites is the Hellacious hot sauce. 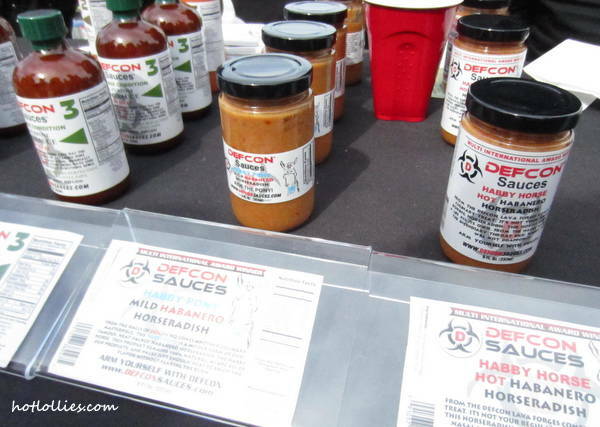 Heartbreaking Dawns 1542 habanero sauce is on the money too! Jersey’s own Born to Hula! I picked up the All Spice Cafe sweet ghost pepper popcorn for that sweet, spicy and salty flavor that’s tough to find along with Sauce Goddess Moroccan twist popcorn for blended flavors of caramel, cardamom and chiles for an amazing complex flavor. You can find these at Peppers.com. 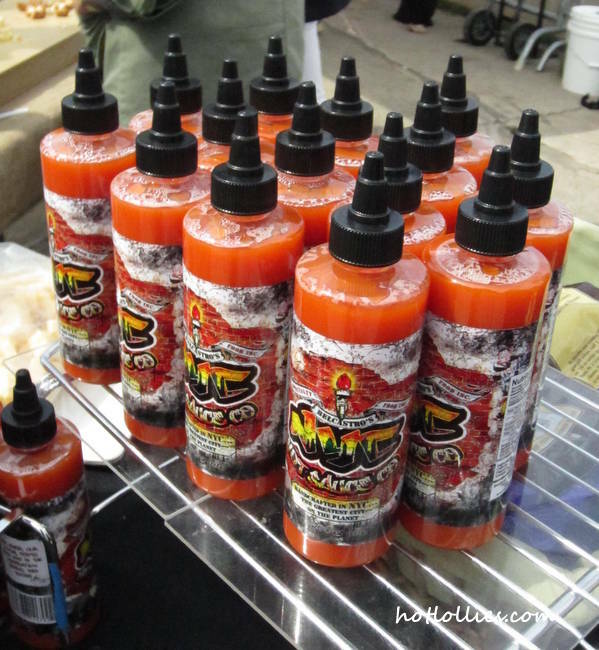 You have to pick up Sinclair’s Fatalii sauce from Sweet Heat’s hot sauce makers. It’s made with tomatoes and the wonderfully fragrant and hot fatalii peppers. Fatalii peppers are very similar to the citrus flavors of the habanero peppers but they are a lot spicier, more fragrant and more prominent fruity flavors. I made a chicken pot pie this weekend and sprinkled some Volcanic Peppers dust for a little heat which surprisingly came through even with the creaminess of the pie. This little jar packs an incredible amount of heat as it should since it is made with just habanero, red peppers and ghost peppers. This A&B hot sauce is a nice Carolina style vinegar based pepper sauce made in NYC. I like the mid-range heat of this sauce and can see it in future bowls of popcorn! Twisted Sister’s guitarist Eddie “fingers” Ojeda’s award winning Ojeda Cherry Habanero sauce made my top list in the sweet and spicy category. It has a great natural cherry flavor and a heat that builds over time. 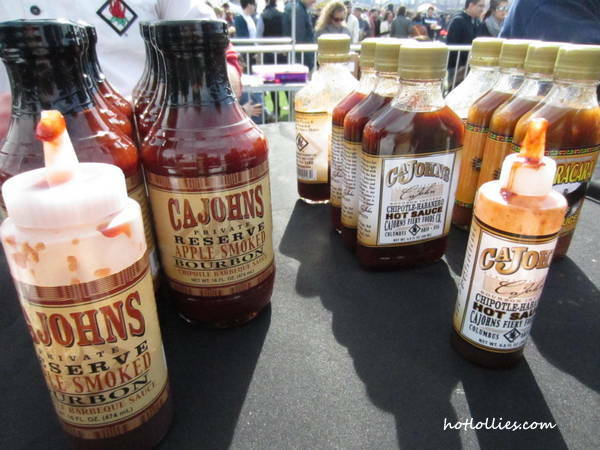 This would be amazing on grilled BBQ chicken or ribs! Whitehouse Station habanero hot sauce delivers pure habanero heat for that clean citrus flavor I’ve come to love. It is one of my favorite peppers right along with the fatalii pepper. Puckerbutt’s Brown Congo Jelly is not your typical thin, overly sweet jelly. This jelly is chunky with lots of pepper bits and the perfect blend of sugar and heat. Smear it on your pork tenderloin next time. Hellfire yeah! I didn’t get to try all of their sauces but Hellfire’s The Elixir just blew me away. Can’t wait to put that on everything! If you can’t handle too much heat and love the flavors of green chiles and tomatillos, this is the sauce for you. This was one of my favorites from NW Elixirs. Fresh, tangy, mildly spicy and perfect on eggs or smothered on baked chicken with melted cheese. Are you hungry yet? Here’s one mini entrepreneur! This little guy, with the help of his mom and dad, created his own hot sauce and bravely tried one of my spicy lollipops! This story is pretty amazing and shows how with great parenting and guidance children can learn essential skills to become successful and gain independence down the road. Not only are they selling the Hot Cha – Waa Cha hot sauces and BBQ sauces, but Dad founded and teaches at the Chef2Be Summer program at the Nyack, NY Culinary Learning Center. The Chefs2Be program is for kids over 10 years old interested in learning about healthy eating and cooking. Visit their website for more details about the program. 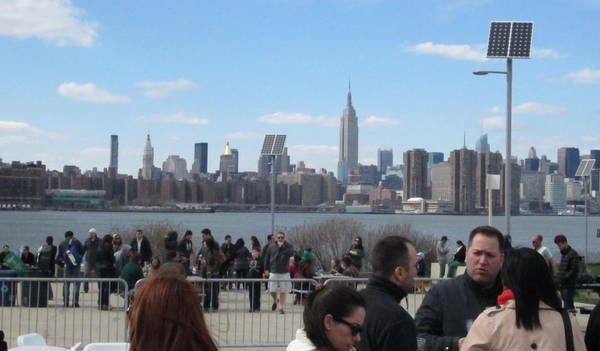 The day outside was miserably wet and cold and thank goodness the event was held indoors this year. I have to say I preferred last year’s set up as vendors booths snaked through venue for easy navigation. This year I found myself a bit overwhelmed and not knowing where to turn exactly but that didn’t matter much, I was on a mission and visited every single booth there, especially the food, beer and liquor booth in VIP. There was also a tattoo artist on hand for those crazy, impulsive moments when you convince yourself you need another! I passed but mostly because they didn’t have any chile pepper designs! ha! More food next time please!! Definitely not enough in the VIP area to get through a day of sampling sauces but the sandwiches were delicious, albeit tiny. oh and I want these earrings! Until next year folks! Hope you enjoyed the photos. Look for Hot Lollies spicy lollipops at next year’s event if all goes well!